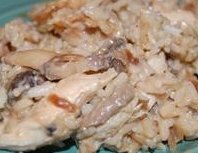 Your going to love my easy chicken and rice recipe. This homemade chicken casserole is easy to prepare and in no time, you will have a delicious meal prepared for your hungry family. Serve with a fresh tossed salad with homemade salad dressing. Delicious. PREHEAT oven to 325 degrees and spray a 9x13 pan with vegetable oil. Heat the butter and canola oil in a large skillet and brown the chicken breasts; remove from heat. Place the dry rice in the bottom of the casserole dish. Whisk the soups, Worcestershire sauce, garlic and onion powder, milk and dry onion soup mix together. Stir in the mushrooms and pour over the rice. Top with the browned chicken breasts. Here's another one of my homemade chicken casserole recipes that is a breeze to make and so good. Serve with a salad and homemade bread. Delicious. I have more than a easy chicken and rice recipe. Please check out more homemade dinner ideas below.